All transactions are safe and secure with a reliable history in online purchasing behind each of our associates. 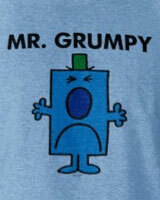 Buy the Mr. Grumpy t-shirt to own Mr. Men clothing and merchandise. Not everyone can be nice and pleasant all the time, just ask Mr. Grumpy. He has a bad attitude and a short temper that is often taken out on books. He rips all the pages out of every book that he comes in contact with, until Mr. Happy comes along. He calls on his friend Mr. Tickle to help him turn that frown upside down. While it doesn't stop him completely, he shows a vast improvement. If you aren't a fan of reading either then get this Mr. Grumpy t-shirt to add to your collection of tees. If he ruined all of your Mr. Men books, then get replacements to pair with your Mr. Men clothing. In addition to the Mr. Grumpy tee above, browse the Mr. Men Clothing Gallery for more apparel like men's and women's clothes, kids shirts or hoodies.